15 May 2019 7.00 p.m.
– Admission to the Inaugural Concert – upon presentation of free admission cards, which will be available at the ticket office at the Podlasie Opera and Philharmonic in Białystok at 1 Odeska str. – Admission to the Gala Concert – upon presentation of paid admission cards, which will be available at the ticket office at the Podlasie Opera and Philharmonic in Białystok at 1 Odeska str. 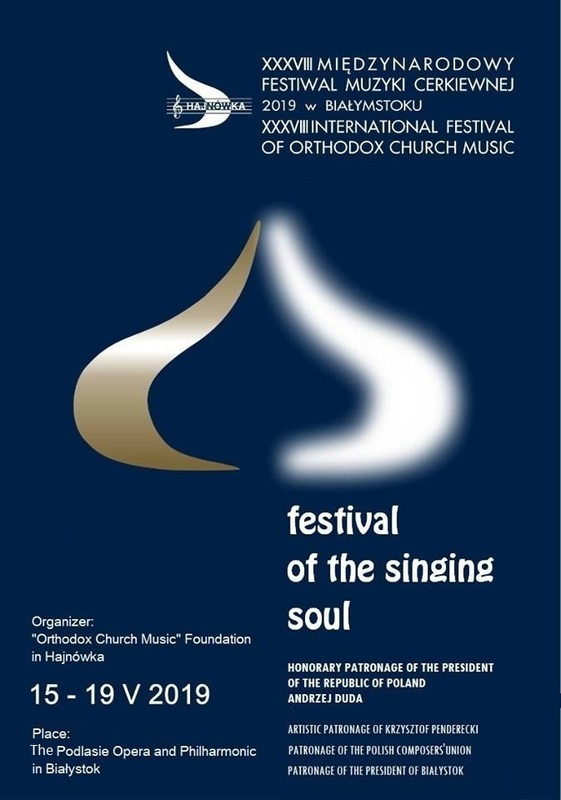 The organizer of the International Festival of Orthodox Church Music “Hajnówka” in Bialystok is the “Orthodox Church Music” Foundation in Hajnówka. We have held the Festival annually since 1982. So far, 869 choirs from 40 countries from Europe, Asia, North America, Africa and Australia have participated in the Festival. We hosted choirs from Armenia, Australia, Belarus, Belgium, Bosnia and Herzegovina, Bulgaria, Cyprus, Czech Republic, Egypt, Estonia, Finland, France, Georgia, Germany, Great Britain, Greece, Hungary, Italy, India, Iran, Israel, Kazakhstan, Kenya, Korea, Lebanon, Lithuania, Latvia, Macedonia, Moldova, Poland, Russia, Romania, Serbia, Slovakia, Switzerland, Sweden, Ukraine, United Arab Emirates, United States and Yugoslavia (Serbia and Montenegro). 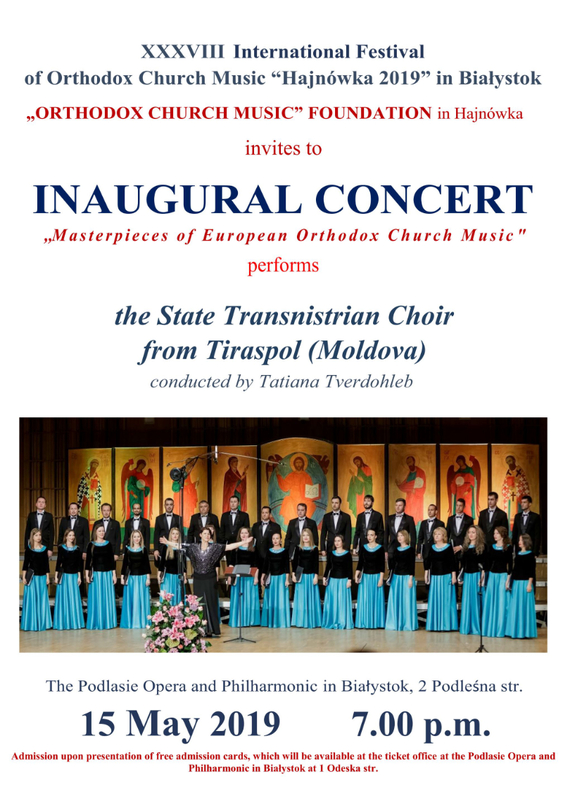 During the Festival orthodox church music is performed by the choirs regardless of their nationality or religion – we host not only orthodox church choirs, but also catholic, Greek catholic, protestant, old-believers’, as well as muslim, buddhist, jewish. The openness of the Festival, the variety of repertoire and cultural diversity is an example of mutual respect and tolerance, confirming the idea of the Festival as the Musical Forum of East and West. The aim of the International Festival of Orthodox Church Music “Hajnówka” in Bialystok is to present the great artistic and spiritual values of Orthodox Church music. Its program also creates opportunities for discussions, meetings, exchanges of experiences and forming new relationships between participants from different environments – thus enriching its aims with aesthetic and educational objectives. The Festival takes place under the Patronage of the President of Poland as well as the Patronage of the Polish Ministry of Culture and the Artistic Patronage of prof. Krzysztof Penderecki – one of the most prominent contemporary composers. Choirs participating in the Festival`s competition are judged by an international jury in the following categories: amateur (parish and secular), children and youth, music academies and professional. In 1995, the Ministry of Culture and National Heritage qualified the International Festival of Orthodox Music „Hajnówka” in Bialystok to the musical art events at the highest level, giving it a „zero category”, same as International Fryderyk Chopin Piano Competition and thus the most famous Polish world music events. Any changes in the repertoire can be reported until 15 March 2019. Applications should be sent to the Organizer’s Office by 20 December 2018. The organizers will inform choirs whether they’ve qualified for the Festival by the end of January 2019. Choirs qualified and invited to participate in the Festival are requested to submit the following information by the end of February 2019. All participating choirs will receive commemorative diplomas. The best choirs will be awarded with prizes. The choirs appointed by the jury are obliged to take part in the Gala Concert (in the same composition as during the qualifying auditions). Participants cover their travel expenses and are to partly finance their visit through a money transfer (20 EURO per person per day) onto the organizers’ bank account to be made by 15 February 2019. A written resignation from the participation in the Festival before 1 March 2019 will allow the return of the transferred funds.